Thierry Racon hit a second-half winner to book Charlton's place in the second round of the Johnstone's Paint Trophy. Addicks assistant manager Tim Breacker was sent to the stands shortly before Racon struck the game's only goal. The midfielder fired in a low drive from the edge of the area that flew in off the right-hand post. Charlton keeper Ross Worner almost handed John Still's side the chance to draw level late on but recovered after spilling a routine cross. It meant a successful debut for new Charlton striker Paul Benson, who had moved to The Valley from Dagenham & Redbridge just 24 hours previously, but he was unable to mark the occasion with a goal. "The goal was obviously disappointing, I just didn't think we got tight enough in the box. "I thought we did excellently again, we've gone to Sheffield Wednesday, Notts County, MK Dons and we've done ever so well. "The team spirit's good and I think the organisation's there." 90:00+4:05 The match has reached full-time. 90:00+2:11 Simon Francis produces a right-footed shot from just outside the box that misses to the right of the goal. 90:00+1:29 The ball is swung over by Darren Currie, Jon Nurse takes a shot. Save by Ross Worner. 90:00+1:19 The ball is delivered by Gareth Gwillim, Miguel Angel Llera makes a clearance. 89:52 Simon Francis concedes a free kick for a foul on Josh Scott. Free kick crossed by Gareth Gwillim, Simon Francis manages to make a clearance. Graeme Montgomery produces a left-footed shot from long distance which goes wide right of the goal. 87:46 Foul by Jon Nurse on Miguel Angel Llera, free kick awarded. Ross Worner takes the free kick. 86:50 Corner taken by Simon Francis played to the near post. 86:17 Josh Scott challenges Kyel Reid unfairly and gives away a free kick. Direct free kick taken by Ross Worner. 85:26 Substitution Alan McCormack replaces Jose Vitor Semedo. 83:52 Substitution Lee Martin goes off and Kyel Reid comes on. 82:35 Romain Vincelot challenges Jose Vitor Semedo unfairly and gives away a free kick. Direct free kick taken by Miguel Angel Llera. 82:03 Simon Francis sends in a cross. 81:48 Pawel Abbott produces a cross. 81:34 Gareth Gwillim sends in a cross, clearance by Christian Dailly. 81:27 A cross is delivered by Graeme Montgomery, Christian Dailly manages to make a clearance. 77:36 Free kick awarded for a foul by Paul Benson on Abu Ogogo. Will Antwi takes the free kick. 77:17 Substitution (Dag & Red) makes a substitution, with Darren Currie coming on for Danny Green. 76:07 Miguel Angel Llera takes the indirect free kick. 76:07 Booking Booking for Danny Green for unsporting behaviour. 76:03 The referee penalises Danny Green for handball. 75:20 A cross is delivered by Matt Fry, save by Chris Lewington. 74:00 The ball is delivered by Scott Wagstaff, clearance by Abu Ogogo. Corner taken by Simon Francis, Miguel Angel Llera gives away a free kick for an unfair challenge on Will Antwi. Chris Lewington takes the free kick. 73:14 Scott Wagstaff produces a cross. 72:03 Substitution Damian Scannell goes off and Graeme Montgomery comes on. 70:28 Danny Green sends in a cross, clearance by Lee Martin. 69:38 Effort from outside the penalty area by Lee Martin goes wide left of the target. 67:48 Mark Arber is penalised for a handball. Simon Francis restarts play with the free kick. 66:07 Substitution Pawel Abbott comes on in place of Akpo Sodje. 65:03 Peter Gain fouled by Therry Racon, the ref awards a free kick. Will Antwi takes the direct free kick. 64:41 Josh Scott has an effort at goal from outside the box which goes wide left of the goal. 64:19 Handball decision goes against Paul Benson. Mark Arber takes the indirect free kick. 62:04 Miguel Angel Llera takes the direct free kick. 62:04 Booking Will Antwi goes into the book. 62:01 Unfair challenge on Miguel Angel Llera by Jon Nurse results in a free kick. 59:25 Centre by Abu Ogogo. 58:47 The ball is sent over by Scott Wagstaff, Lee Martin takes a shot. Chris Lewington makes a save. 58:05 The assistant referee signals for offside against Akpo Sodje. Chris Lewington takes the indirect free kick. 57:16 Free kick awarded for a foul by Josh Scott on Miguel Angel Llera. Ross Worner takes the free kick. 56:02 Assist by Matt Fry. 56:02 GOAL - Therry Racon:Charlton 1 - 0 Dag & Red Goal scored by Therry Racon from the edge of the penalty area to the bottom left corner of the goal. 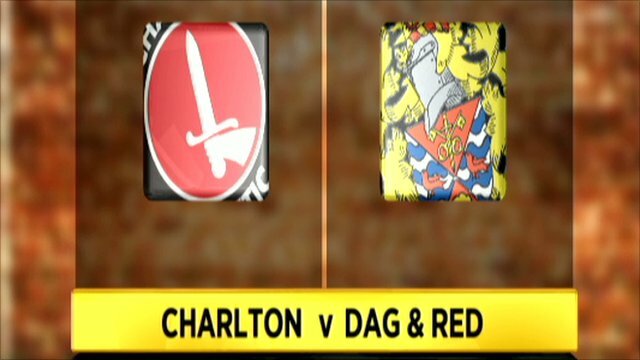 Charlton 1-0 Dag & Red. 55:41 A cross is delivered by Lee Martin. Simon Francis crosses the ball, Will Antwi makes a clearance. 54:04 Booking Caution for Abu Ogogo. 53:51 Free kick awarded for a foul by Abu Ogogo on Scott Wagstaff. Miguel Angel Llera restarts play with the free kick. 53:11 The official flags Akpo Sodje offside. Free kick taken by Chris Lewington. 52:49 Foul by Jon Nurse on Matt Fry, free kick awarded. Ross Worner takes the direct free kick. Correction - 51:11 Booking Booking for Scott Wagstaff. 51:11 Booking Danny Green receives a caution for unsporting behaviour. 50:44 The ball is swung over by Peter Gain, blocked by Miguel Angel Llera. 49:58 The ball is swung over by Gareth Gwillim, Christian Dailly manages to make a clearance. 48:12 Jose Vitor Semedo fouled by Peter Gain, the ref awards a free kick. Free kick crossed right-footed by Simon Francis. 46:21 Miguel Angel Llera fouled by Josh Scott, the ref awards a free kick. Ross Worner restarts play with the free kick. 45:43 Free kick awarded for a foul by Simon Francis on Jon Nurse. The free kick is delivered right-footed by Danny Green from left wing. 45:00+3:19 The referee blows for half time. 44:50 Free kick awarded for an unfair challenge on Ross Worner by Josh Scott. Ross Worner takes the free kick. 44:36 The ball is sent over by Peter Gain, Ross Worner makes a save. 42:40 Lee Martin takes a long range shot clearing the crossbar. 41:29 Therry Racon concedes a free kick for a foul on Romain Vincelot. Mark Arber restarts play with the free kick. 37:58 Damian Scannell delivers the ball. 37:32 Simon Francis delivers the ball. 35:19 The assistant referee flags for offside against Scott Wagstaff. Chris Lewington restarts play with the free kick. 34:25 Danny Green sends in a cross, Matt Fry gets a block in. 33:30 Free kick awarded for an unfair challenge on Danny Green by Matt Fry. Chris Lewington takes the direct free kick. 26:00 The ball is sent over by Simon Francis, Abu Ogogo manages to make a clearance. 24:41 Lee Martin gives away a free kick for an unfair challenge on Damian Scannell. Free kick taken by Chris Lewington. 21:48 Therry Racon concedes a free kick for a foul on Romain Vincelot. Free kick taken by Danny Green. 19:16 Jon Nurse delivers the ball, blocked by Christian Dailly. Outswinging corner taken right-footed by Danny Green, Christian Dailly manages to make a clearance. Corner taken by Danny Green played to the near post, Akpo Sodje makes a clearance. 18:37 Peter Gain challenges Lee Martin unfairly and gives away a free kick. Simon Francis takes the direct free kick. 17:54 Centre by Lee Martin, Paul Benson takes a shot. Save by Chris Lewington. The referee blows for offside against Akpo Sodje. Free kick taken by Chris Lewington. 17:32 Jon Nurse handles the ball and concedes a free kick. Direct free kick taken by Ross Worner. 15:47 Free kick awarded for a foul by Romain Vincelot on Jose Vitor Semedo. Miguel Angel Llera takes the direct free kick. 13:25 The referee gives a free kick against Will Antwi for handball. Miguel Angel Llera produces a strike on goal direct from the free kick, Jon Nurse gets a block in. 11:32 The ball is swung over by Danny Green. 11:05 Shot from 12 yards from Paul Benson. Save made by Chris Lewington. 9:13 Paul Benson takes a shot. Chris Lewington makes a save. Corner taken by Simon Francis. 8:46 Shot from just outside the box by Damian Scannell goes over the bar. 8:01 Will Antwi delivers the ball, Matt Fry manages to make a clearance. 7:37 Corner taken by Danny Green, Simon Francis manages to make a clearance. 7:23 Jon Nurse takes a shot. Blocked by Miguel Angel Llera. 6:10 Damian Scannell concedes a free kick for a foul on Jose Vitor Semedo. Direct free kick taken by Ross Worner. 4:15 Unfair challenge on Akpo Sodje by Romain Vincelot results in a free kick. Miguel Angel Llera restarts play with the free kick. 3:31 A cross is delivered by Damian Scannell, Danny Green takes a shot. Matt Fry gets a block in. 2:45 Scott Wagstaff produces a right-footed shot from just outside the area that goes wide left of the goal. 2:04 Danny Green fouled by Matt Fry, the ref awards a free kick. Will Antwi takes the direct free kick.